The Raleigh Public Relations Society is excited to launch a new, all-digital submission platform for the 2018 Sir Walter Raleigh Awards for Excellence in Communication. The award submission process will be more efficient, allowing for work to be saved, files as large as 50Mb to be uploaded, and deadline reminder notifications. 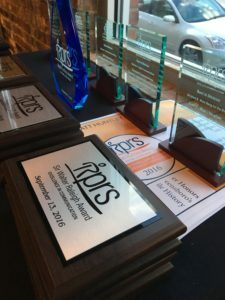 RPRS will recognize 38 award categories of campaigns and tactics, as well as PR Team of the Year and PR Pro of the Year. The Watt Huntley Lifetime Achievement Award, the society’s highest honor, will recognize an individual who has made lasting and meaningful contributions to public relations over the course of a career. See a full list of 2018 award categories by clicking here. A big thanks to our sponsors, York Properties and the North Carolina Biotechnology Center, whose generous contributions allowed RPRS to launch this powerful tool this year. Q: How much do I save by becoming a member? A: $20 on each award entry, plus $10 each month for luncheons at 18 Seaboard, and discounts at the seasonal socials. Assuming you submit one award entry a year the total estimated annual savings is $150. A: Go to the Join page on the RPRS.org website. Q: Where can I view the full list of award categories? Q: How much are the 2018 submission fees and what are the deadlines? A: Log-in and visit the Judging Criteria page. Q: When is the awards banquet? A: Tuesday, October 23 at 6:00 p.m. Location TBA. A: Awards Chair David Dean at awards@rprs.org.